I have thoroughly enjoyed absorbing this book bit by bit over the past few months. It is not only an intimate portrait of Delacroix, but also sparkles with ideas about human nature, art, the natural world, music and philosophy. It was initially a different book that ignited my interest in Delacroix, Arlette Serullaz’s “Delacroix”, one of the “Louvre Drawing Gallery” series. 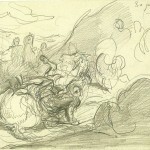 I had been amazed by the variety of drawing styles showcased in Serullaz’s book, from carefully decorative (see “Jewish Bride in Tangier”) to gestural (see “Thrown horseman in a landscape”), and from studies of the natural world (see “Head of Lion Roaring”) to envisioned images (see “Hamlet and his father’s ghost”). To identify pictures in this and other posts, scroll over them with your mouse. My first thought was that the artist who produced such a wealth of images must have had a constant stream of ideas and an open mind. On investigating Delacroix further, I read that he is renowned for his feverish imagination, but also had an unusually logical approach to his work, for example making rigorous notes on colour mixing. 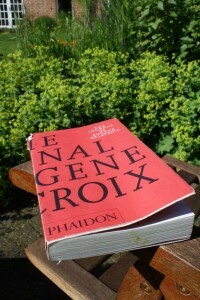 This combination of inspiration and logic in an artist is fascinating, so the next step for me was to read his journal. 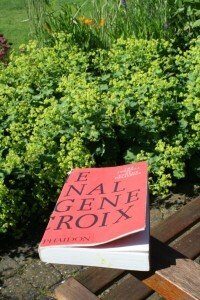 I have the paperback version published by Phaidon, “The Journal of Eugene Delacroix” tranlsated by Lucy Norton, edited and introduced by Hubert Wellington. A huge amount of content is packed into this slim volume, the text printed on amazingly thin paper followed by 81 black and white plates. Including appendices and index, this portable little book contains a surprising 570 pages. The journal runs from 1822 (when Delacroix was 24 years old) to a few months before his death in 1863. Delacroix noted down all kinds of thoughts, from immature ideas about pretty girls or concerns about money, right up to philosphical discussion on what is and is not art. It includes a fantastic cast of famous characters from Delacroix’s social circle. 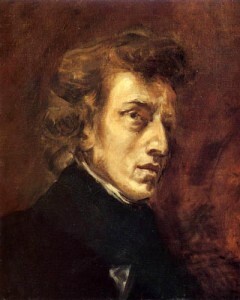 As I have a musical background, the most interesting of these to me is the composer and pianist Chopin (below) who was an intimate friend of Delacroix. 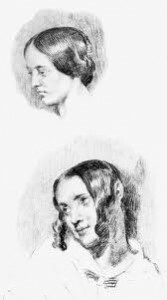 There is also mention of the great violinists Paganini and Ernst, and Delacroix wrote of his conversations with George Sand, Alexandre Dumas, Charles Baudelaire and many others. Fascinating to me is the relationship between Delacroix and his servant, Jeanne-Marie le Guillou (“Jenny”), who worked for him devotedly from 1834, cared for him through his illnesses and on his deathbed, and did what she thought was best to safeguard the notebooks after his death. Here I shall list the themes within the journal that most appealed to me. Delacroix had far, far more to say on each subject than the odd snippets that I have included here. If you are curious about one or more of these then get in touch, as I can add details about specific topics in future posts. On 12 October 1853, Delacroix discussed the way in which the artist can work carefully from a model within the context of an imaginative picture, and in so doing, “…You will have introduced reality into a dream, and united two different arts”. Delacroix had much to say about learning and knowledge. Although he was forever reading, he wrote on 5 October 1855, “…I can learn far more by looking than the inventions of any scribbler could teach me”. There are plenty of ideas on the practical process of picture-making, from the laying-in process, to the use of finishing touches, and from the use of tones to specific paint colour choices and thoughts on edges and visible marks. Delacroix loved to walk in the countryside and he observed nature closely. Scattered throughout the journal are observations on what he has seen, from the colour of a slug and the behaviour of insects, to the shapes of trees and rocks and the appearance of water and marks in the sand. Delacroix hoped to create a dictionary of the fine arts. This task was never completed, but he compiled many ideas and definitions which are included in the journal from 11 January 1857. Delacroix discusses the work of other artists. Even those that he loved as “Old Masters” were analysed in a critical way, from Michelangelo to Rubens. His thoughts on writers and composers are also fascinating. The importance of avoiding too much detail in a picture is a recurring theme throughout this artist’s journal. For me, this is the book’s practical “take home message”. What is the importance of accuracy and realism within a painting? This is another recurring theme of the journal, tying in with Delacroix’s thoughts on leaving out unneccessary visual details. On 9 October 1855, he writes of painting boats: “What I require is accuracy for the sake of the imagination.” He scorns the average marine painter: “Their ropes are mere lines, drawn in hastily and according to formula; they are put there simply as reminders and serve no real purpose.” And he goes on to say, “My kind of accuracy, on the other hand, would consist in strongly sketching in only the principal objects, but in such a way as to show their essential functions in relation to the figures in the painting”. Delacroix has numerous thoughts on this subject. He writes of originality of ideas, seeking perfection and aiming for the impossible. 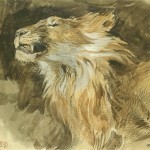 Delacroix discusses instinct, inspiration and discipline, and idealisation, reality and dreams. There is a passage on being beyond ourselves, and another on expressing the effect of the moment. He also writes of imagination, the conception of an image and the supreme image. As you might expect, this is a major theme of the journal. 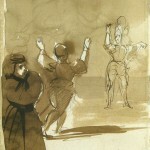 Delacroix discusses the matter of conceiving ideas for pictures. He writes of a freedom and wealth of ideas, and of how the artist needs some daring. There is a section on inspiration and ongoing discoveries. 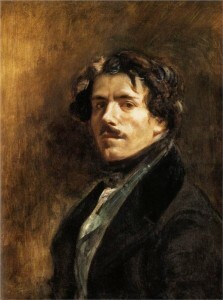 Delacroix describes how inspiration may be suppressed by prejudices and also by habit: “In the arts especially, a man needs to possess very deep feeling if he is to maintain his originality of thought in spite of habits which even talented artists are fatally prone to acquire” (March 1st, 1859). And take note of this, from 8 March 1860: “An artist should not treat himself like an enemy. He ought to believe that there is value in what his inspiration has given him”. Delacroix’s journal leaves me wanting to draw and paint, and also to look at the world more closely. However, I wonder what is out there for future reading. Can anyone recommend other interesting pieces of writing or discussion by artists? Delacroix’s journal itself does not include much on his 1832 Moroccan journey. He did make many sketches and notes abroad but only a few pages of this writing (without the corresponding sketches) are included in my Phaidon edition. 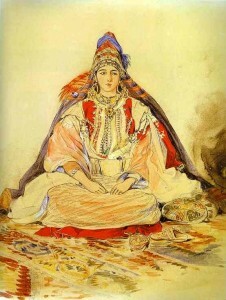 Perhaps I should get hold of the book, “Delacroix:Moroccan journey“? Any book recommendations would be gratefully received.